3. ANTIAIRCRAFT ARTILLERY. a. Introduction. It has been emphasized to the Japanese soldier that effective antiaircraft defense depends on the use of all arms. Many of the weapons primarily designed for ground action and previously described under infantry armament also are designed to perform an antiaircraft role. (1) The new basic infantry weapon model 99 (1939) 7.7-mm rifle (fig. 228) has a rear sight, with arms calculated to give the rifleman the approximate lead required to hit a low flying plane. Figure 228. 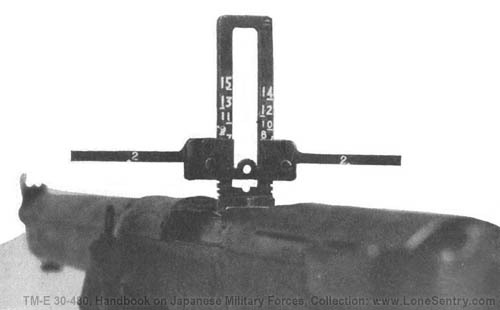 Rear sight on model 99 (1939) 7.7-mm rifle. (2) The model 92 (1932) 7.7-mm heavy machine gun (fig. 229) is provided with an antiaircraft adapter as illustrated in figure 229, and standard antiaircraft ring sights. Figure 229. 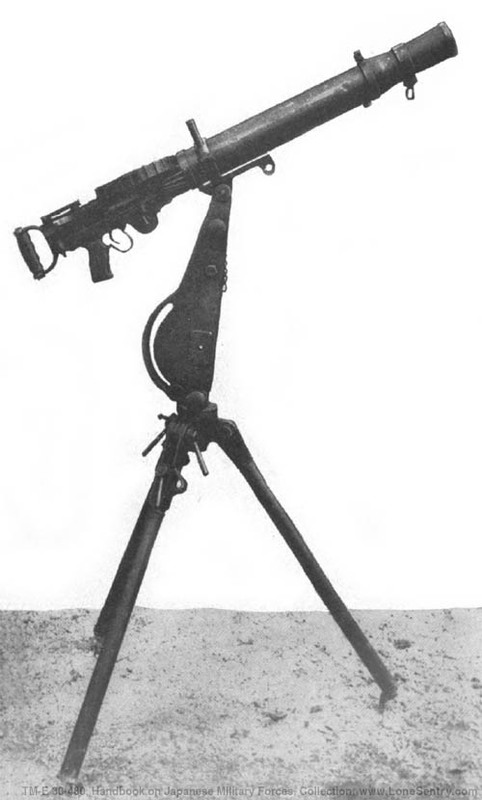 Model 92 (1932) 7.7-mm HMG with AA adapter. (3) The Lewis type model 92 (1932) 7.7-mm machine gun (fig. 230) has a standard mount which can be adapted for antiaircraft defense (see fig. 230). Figure 230. Model 92 (1932) 7.7-mm machine gun (Lewis type) in position for AA fire. 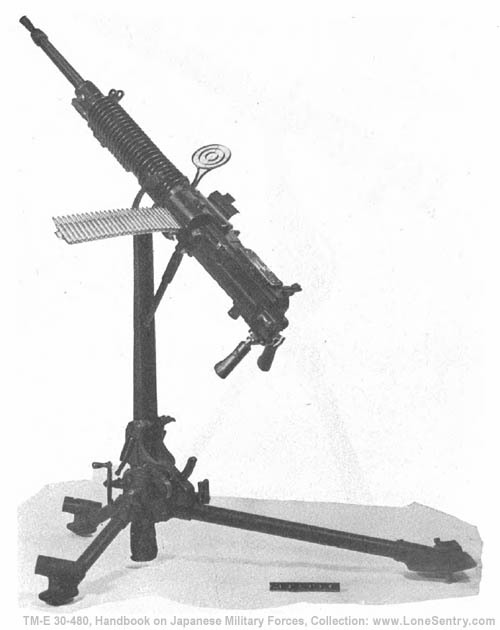 (4) The model 93 (1933) 13-mm machine gun is shown in figure 231 in a dual mount for antiaircraft fire. Figure 231. Model 93 (1933) 13-mm machine gun (Dual mount). 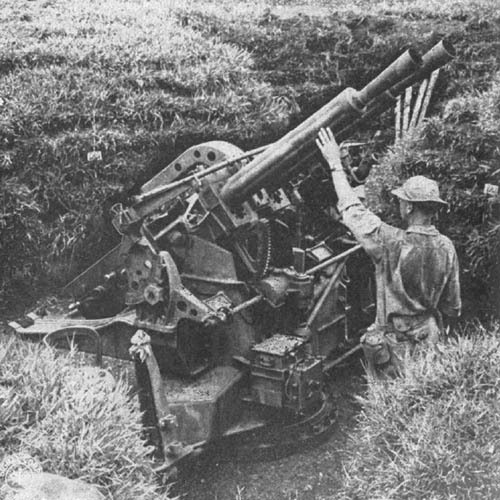 (5) The model 98 (1938) 20-mm AA/AT automatic cannon and probably the 70-mm barrage mortar (Chap. 9, Sec. II) have been designed principally for an antiaircraft role. (6) In addition to the more common antiaircraft weapons described in detail on the following pages, 120-mm and 127-mm naval antiaircraft guns have been encountered. The latter were in dual mounts. 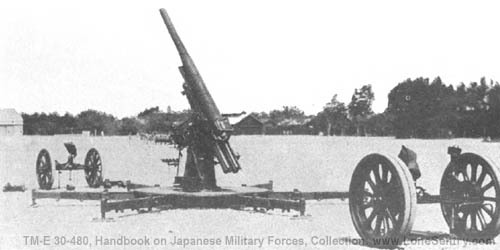 (7) There are indications that Japanese heavy AA artillery is possibly more modern and of larger caliber than the standard 75-mm model 88, which is the only heavy antiaircraft weapon captured in quantity to date. (8) Tabulated below are the estimated capabilities of Japanese antiaircraft weapons. Information concerning fire control equipment used with some of the weapons listed will be found in Chapter 10.
b. Model 96 (1936) type 2, 25-mm antiaircraft-antitank automatic cannon. (1) General description. This (fig. 232) is a gas-operated, air-cooled, magazine-fed, full automatic, or semiautomatic machine cannon. It has been found in dual and triple fixed mounts, emplaced customarily around air strips for antiaircraft defense. However, it is capable of a 10 degree depression which makes it effective for direct fire against ground targets. Traverse and elevation are controlled by hand wheels. Figure 232. Rear view of model 96 (1936) type 2, 25-mm AA/AT automatic cannon, triple mount. Estimated vertical range 14,000 feet. Weight (single gun without mount) 246 pounds. Weight (three guns triple mount) 5,330 pounds. Cyclic rate of fire (per barrel) 300 rounds per minute. Muzzle velocity 2,978 feet per second. (3) Ammunition. The weapon is furnished with high explosive tracer, high explosive, and armor piercing tracer ammunition. c. 40-mm single and dual antiaircraft and antitank automatic cannon. (1) General description. This weapon (fig. 233) is a Vickers type recoil operated, water-cooled, link belt-fed, automatic or semiautomatic machine cannon. Several of these have been captured. Single mounted guns were marked "Vickers-Armstrongs 1931," but the dual mounted guns were Japanese-manufactured copies. Elevation and traverse are obtained by hand. The weapon is fitted with a telescopic calculating sight and an automatic fuze setter. Figure 233. Dual mounted 40-mm Vickers type AA/AT automatic cannon. Maximum vertical range 14,000 feet (approximately). Weight in firing position (dual mounted gun) 2,500 pounds (approximately). Length of barrel 5 feet 2 inches. (3) Ammunition. Armor piercing high explosive, high explosive with time fuze, high explosive with point detonating-fuze, and tracer. 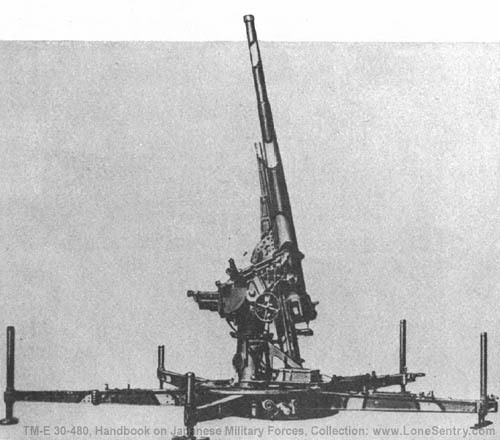 d. Model 88 (1928) 75-mm antiaircraft gun. (1) General description. This has been the standard Japanese mobile heavy antiaircraft weapon (fig. 234). Specimens have been found on all airfields captured from the Japanese. It is a truck drawn weapon. 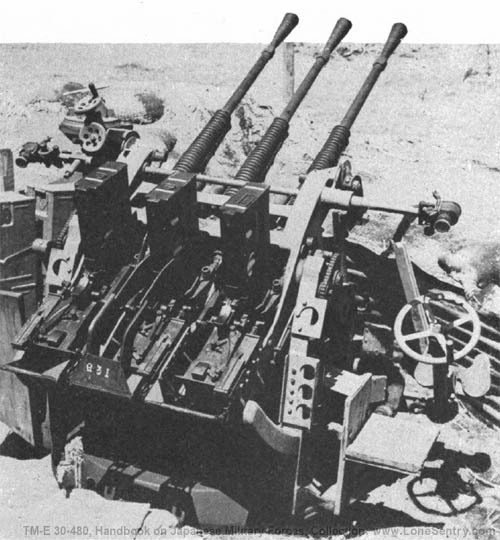 For firing, the wheels are removed, and the gun is supported by five outriggers. During transit, the barrel is dropped back on a cradle extension and secured to the ends of two outriggers. The gun has a hydropneumatic variable recoil system and a semiautomatic horizontal, sliding wedge breech mechanism. Fire control instruments captured indicate that the older system of transmitting corrections to the gun pointers vocally is still in use. However, evidence is on hand that an electrical data transmission system and operation by the "Matched Pointers" method is used sometimes. This gun has been used against ground targets. Figure 234. Model 88 (1928) 75-mm antiaircraft gun. Muzzle velocity 2,360 feet per second. (3) Ammunition. High explosive, shrapnel, and incendiary. 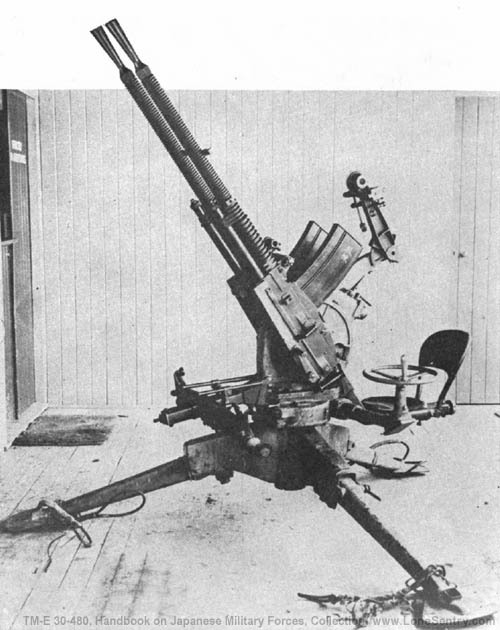 e. Model 14 (1925) 105-mm antiaircraft gun. (1) General description. This is the heaviest mobile Japanese antiaircraft weapon (fig. 235) in use at present. As originally designed, it was not satisfactory, and probably has been redesigned by this time. It has a pedestal mount, horizontal sliding breechblock, and a hydropneumatic recoil system. In firing position the wheels are detached and the gun rests on six outriggers. Thirty to 45 minutes are required to prepare the gun for action. The fuze setter is continuous and automatic. Figure 235. Model 14 (1925) 105-mm antiaircraft gun showing detachable wheels used for transport of piece. Weight in firing position 7 tons. Muzzle velocity 2,300 feet per second.